Buy 3 packs, Get 1 FREE! Free goods will be of equal or lesser value to lowest price purchase item. Diamond impregnated polishing system restores natural shine to porcelain and eliminates re-firing. Autoclavable. Recommended speed: 5,000-7,000 rpm. Use yellow for reglazing / high shine. Contains 7 polishers: 2 x P0352 pre-polishing points, 2 x P0355 pre-polishing cups, 1 x P30032-3 high shine large point, 1 x P30033-3 high shine small point, and 1 x P30035 high shine cup. Three-step set for making minor adjustments and polishing porcelain/ceramic restorations. Contains: 1 ea. P332-3, P336-3, P335-3 green RA to remove scratches or make minor adjustments; 1 ea. P3032-3, P3035-3, P3036-3 blue RA to pre-polish and achieve lustrous finish; 1 ea. P30032-3, P30035-3, P30036-3 yellow RA for high shine finish. 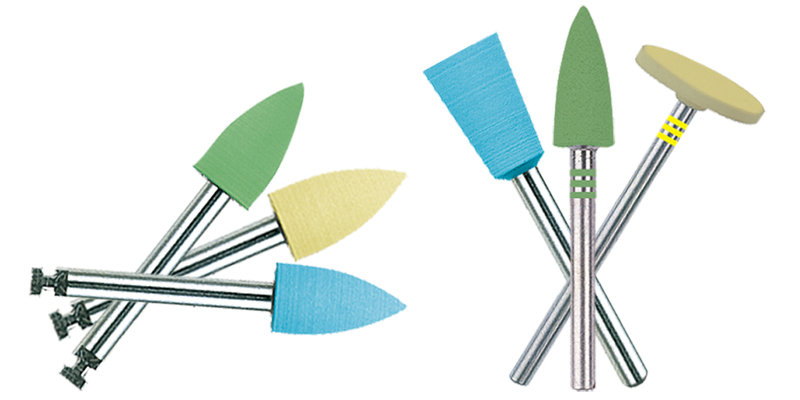 Kit contains the essential polishers for finishing porcelain:10 unmounted P0301 pre-polishers; 1 ea. P3044, P3042, P3043 blue HP for refinement; 1 ea P30044, P30042, P30043 yellow HP for reglazed finish. Delivered in a white plastic block. For adjustment and polishing of porcelain and ceramic crowns. Contains 9 instruments: P332-3 pre-polishing point (green), P335-3 pre-polishing cup (green), P3032-3 refining point (blue), P3035-3 refining cup (blue), P30032-3 high shine point (yellow), P30035-3 high shine cup (yellow), and 3 Zir-Cut diamonds (1 ea. Z390-018, Z368-023, Z856-018.